"There was surrender and treason. But anti-Semitism had also begun to rear its ugly head. Many who used to hide their feelings openly declared their anti-Semitism, to the point that France began adopting certain German values, and sought to get closer to Hitler." The Sorrow and the Pity (Le Chagrin et la pitié) was produced by Marcel Ophuls for French television, but never aired as originally intended. It found an audience for its frank discussion of human strength and weakness on the big screen, despite its four-hour running time. 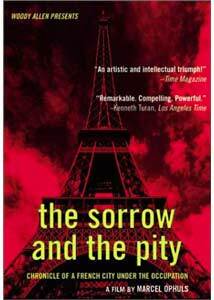 The Sorrow and the Pity: Chronicle of a French City Under the Occupation documents the experience of France during its occupation by Hitler's forces during World War II. Filmmaker Woody Allen (a longtime supporter who featured the film prominently in Annie Hall), Milestone Films and Image Entertainment have arranged for the release of Ophuls' masterpiece on DVD, after fifteen years of near-total unavailability. Part One: The Collapse discusses France's defeat by the Nazis and its immediate aftermath. Through interviews and historical film clips, Ophuls covers the defeat of the French, the pre-emptive destruction by the British of the French navy at Mers-el-Kabir, and the French-German Collaboration instituted by Laval in Vichy France. Archival footage of Hitler touring Paris, women dying their legs to mimic hard-to-get nylon stockings, and French villagers fleeing the countryside document the events of the time. More unsettling are scenes from the German film Le Juif Suss, a propaganda feature demonizing the Jews, and discussions of the anti-Semitism that seeped into French life during the Occupation. Former French (and Jewish) Prime Minister Pierre Mendes-France discusses the false accusations of desertion that made him a political non-entity, and many others address the firings of Jewish teachers, Vichy's Jewish Decrees, and other terrifying examples of the facility with which the "values" of Nazism might have spread. Part Two: The Choice addresses the later years of the Occupation. Tales of polite dislike between the French and the Germans at concerts and in brothels are contrasted with stories of La Resistance and the Free French under Charles de Gaulle. Denis Rake, a homosexual Resistance radio operator, tells of his affair with a German soldier. Stories of collaboration by the French police, who handed over Jewish prisoners and arrested Jewish children, are supplemented by accounts of frame-ups and sadistic torture and abuse. Pre-War political conflicts between Fascist and Communist factions in France are examined briefly, and Maurice Chevalier appears in a vintage newsreel to refute rumors of his death and/or wartime performance tours in Germany. What makes The Sorrow and the Pity so powerful is the intimate, human perspective provided by Ophuls' extensive interviews. Some contributors are cold, recalling their own willingness to make moral compromises even as they deny the worst accusations leveled against them; others discount their own heroism, scarcely recognizing their contributions to the tide that slowly but surely turned against Hitler. It's easy and popular to insist that Hitler's virulent, state-sponsored genocide was an anomaly, something that will never happen again. But the experiences of occupied France, in evidence here, tell another story—the all-too-human ability to abandon morality when military force and propaganda make it convenient to do so. Marcel Ophuls' moving and horrifying documentary is a must-see in the most fundamental sense of the word—it's not always easy to watch, but it has many valuable lessons to teach us. NOTE: The player-generated English subtitles on this DVD release are fairly comprehensive, but they omit the names of most of the interviewees. According to Milestone Films' press release, this has been corrected on new release prints, and all names will be displayed in future video editions. The lack of speaker identification doesn't damage the film irreparably, but it does make it more difficult to get one's bearings on occasion. Image Transfer Review: The Sorrow and the Pity is presented in its original 1.66:1 widescreen theatrical aspect ratio, letterboxed within a 4:3 nonanamorphic frame. The source print has not aged well, exhibiting numerous scratches, specks and splices, with some damage here and there; some archival footage is understandably in poorer condition than the film proper. Black level is on the gray side in a few segments, and there's a bit of "floatiness" in unstable shots that deceived the MPEG-2 compression motion-prediction algorithms. The transfer is rendered at 30 frames-per-second with 3:2 video pulldown, rather than at the film's native speed. Part One uses a single-layer transfer, while a dual-layer disc is devoted to Part Two, but both discs look similar overall. Not a gorgeous transfer by any means, but the 2-disc set presents this black&white documentary legibly enough. Audio Transfer Review: The Sorrow and the Pity retains its original French language soundtrack, presented in Dolby 1.0 monophonic format. Interviewees speak in French, German and English, with overdubbed French translation and player-generated English subtitles for all but one segment (in spoken English). The electronic labeling is incorrect, flagging the audio track as "ENG" instead of "FRA." Frequency and dynamic range are notably limited, and there are a few audio pops here and there, but this is generally a clean digital transfer of a dated, low-budget soundtrack. Extras Review: The Sorrow and the Pity on DVD features 30 text-menu chapter stops (14 for Part One, 16 for Part Two), optional English subtitles, and the original theatrical trailer. The subtitles are quite comprehensive and seem accurate, though one title in Part Two is displayed too briefly to be read and one section in spoken English is not subtitled. The theatrical trailer features sterile English narration over footage from the film, with a slightly unstable digital transfer; the same trailer appears on both discs in the set. There are no real "extras" here, but the film stands well enough on its own. Milestone Films provides more extensive background information at the company's website, material which was unfortunately not included with the 2-disc DVD set. Marcel Ophuls' The Sorrow and the Pity is an informative and moving documentary about the French experience under German Occupation during World War II. Image's 2-DVD set presents the four-hour documentary in its entirety, with new, comprehensive subtitles. The film has not aged well physically, but it's still a tremendously valuable and cautionary oral history. Recommended.